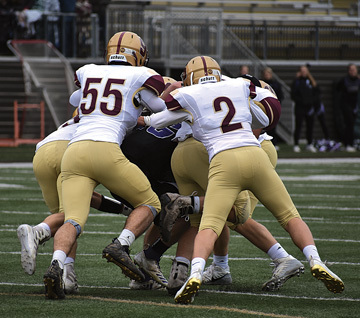 SPRINGFIELD — In order to have success this year, the Springfield football team knew that it had to adjust from week to week and every week there had to be improvement. The Tigers started out the year with a new offense and went 0-2. They were able to score points early in the season, but stopping teams from scoring was an issue. The Tigers have had an impressive playoff run that saw them qualify for their first state tournament trip since 2008. 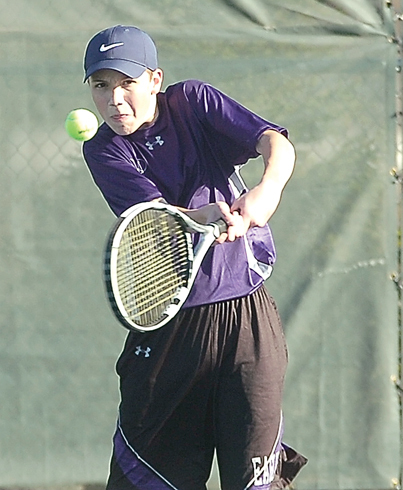 On Saturday, they play Lester Prairie/Holy Trinity at 4 p.m. in Shakopee in the Class A state quarterfinals. Since the playoffs started, the Tigers are outscoring their opponents 79-50. But what stands out the most is the defensive mindset. Ivan Hovland leads the team in tackles with 135, including four fumble recoveries. Mason Rummel is second on the team in tackles with 110 and four fumble recoveries and Curtis Tauer has 65 tackles. For the defense, the hard work that they’ve put in all season is paying off. “Once we came together as a team, we really worked hard this summer and that’s what made it right there,” Rummel said after Friday’s win over Murray County Central in the Section 3A title game. The Tigers’ offense is also much improved this year. The Tigers are averaging 26 points per game and feature a balanced attack. Junior quarterback Decker Scheffler has thrown for 2,212 yards and 23 touchdowns. His favorite target is 6-foot-4-inch Isaac Fink, who has 58 receptions for 1,031 yards and 15 touchdowns. 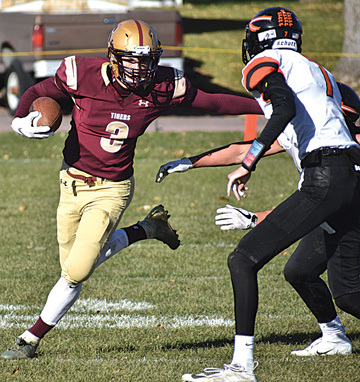 Jordan Kieper is also having a big year, hauling in 43 receptions for 694 yards and six touchdowns. Fink and Scheffler have now qualified for the state tournament in three different sports. They helped win a state championship in baseball in 2016 also went to state with the Tigers in basketball. While there were may have been some doubters this year, both of them believed that going to state in football was possible. The Tigers can obviously throw the ball, but lately they’ve use the run game to their advantage as well. Rummel is the team’s leading rusher with 734 yards on 146 carries and two touchdowns. Scheffler is also a threat to take off with the ball, rushing for 664 yards on 145 attempts and six touchdowns. Fink has three rushing touchdowns and 188 yards on just 18 carries, so they use him well, too. The line has also played its best as of late. Rogotzke said learning the new offense was difficult at first, but they’re much more confident now. The Bulldogs are 8-3 and are winners of five straight. Their last loss was on Oct. 5 in a 26-22 loss to Kenyon-Wanamingo. They have a balanced rushing attack with Tyler Scheevel and Dylan Ruzicka. Scheevel has 983 yards rushing on 167 attempts and Ruzicka has 535 yards rushing on 140 attempts. Scheevel has 16 touchdowns rushing while Ruzicka has five rushing scores. Ruzicka also has 340 yards receiving and five receiving touchdowns on 24 receptions. Parker Bayerl leads the team with 34 receptions for 407 yards and three touchdowns. Quarterback Michael Ziermann has completed 127 passes for 225 yards and 1,663 yards. He has 15 passing touchdowns and five rushing touchdowns. Defensively, Scheevel also leads the team with 127 tackles and Nathaniel Hauladen has 63 total tackles. The current Tigers were in elementary school the last time the program went to state. And they had dreams way back then of this possibility, which is now the reality. “It’s something I’ve dreamed of since I was little, it’s amazing,” Rogotzke said.